The Context of White Supremacy hosts the third study session on Gwen Ifill’s 2009 bestseller, The Breakthrough: Politics and Race in the Age of Obama. An award-winning journalist and anchor at PBS, Ifill, 61, died from cancer in November of this year. 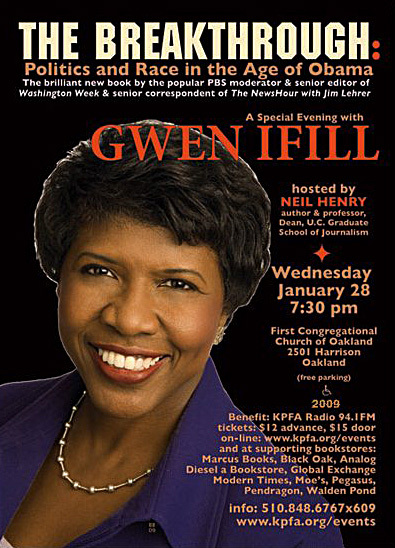 Ifill was one of the few black female mainstream journalists, and she frequently addressed Racism during her journalism career. In fact, White Supremacy likely contributed to her passing at such a young age. During last week’s session, Ifill dissected differing black opinions on Obama’s 2008 presidential campaign as well as the senator’s excruciating task of “straddling” the “racial divide.” Ifill cataloged how Obama had to appease White voters by renouncing Louis Farrakhan, admonishing Rev. Jeremiah Wright, periodically castigating black people, and “stiff arming” Jesse Jackson and Rev. Al Sharpton. Ifill also discussed how Racist Women weaponized feminism to castigate those who would support a non-white candidate over Hillary Clinton. Interestingly, Ifill references a myriad of black scholars and journalists – Melissa Harris-Perry, Alice Walker – and even Admitted White Supremacist Timothy Wise, who all recognized how a significant population of White Women were, as Wise wrote, “Not thinking and acting as women,” but as White Supremacists. It’s stunning that eight years later, after Trump’s victory we are again “surprised” that White Women’s allegiance to White Supremacy made a substantial impact in the voting booth. Listeners should contrast how Ifill’s presentation of Racism with the pending Trump Administration.